The Runner | Public Relations Cohort Holds Gala for "Forgotten Children"
This year’s graduating cohort from KPU’s public relations program has spent the past five months preparing an event to support the children of people who are incarcerated. 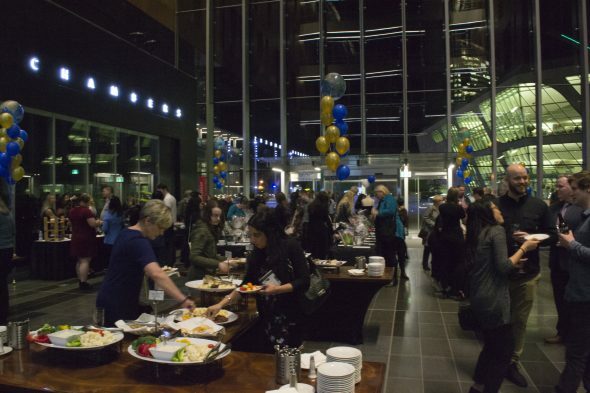 The group’s work culminated in a gala held at Surrey City Hall on March 1, with all funds from the event going to support charitable organization JustKids. Each year, the graduating public relations cohort selects a charity to support. One of the students, Cassia Lachance, says that the class knew right away that they wanted to donate to a cause for children because all of the charities brought up for consideration for this year’s event supported children in some form. After selecting JustKids as the benefactor, the class got to work on planning the event by finding a caterer, entertainment, sponsors, suppliers, and more. “We’re just really happy and really excited to be throwing this event to benefit these kids who really need our support,” says Lachance. Tickets were sold for $40.00, which included appetizers and desserts as well as a chance at door prizes. All proceeds from the bar, silent auction, and games went to support JustKids. KPU President Alan Davis, as well as representatives from the public relations cohort and JustKids, spoke at the event. Children of parents who are serving prison sentences are at extreme risk for poor life outcomes. On top of the emotional stress of having a loved one in prison, these children are often stigmatised for their connection to parents convicted of crimes. They often lack the critical support structures needed to sustain their emotional needs and learn important life skills. JustKids is a fully donor-funded organization dedicated to providing support for “forgotten children”. It offers several initiatives to help these kids, including a storybook program in which volunteers bring a book and recording equipment to parents in prison to record them reading it aloud. The book and the recording are then given to the child to help maintain the connection between parent and child. The organization also offers a free summer camp, a Saturday club for kids aged two to six and seven to 12, and workshops to teach kids vital life skills like budgeting and cooking.